Slope View 3BR/3BA. Washer and Dryer in Unit! All remaining spring dates reduced! Sit on our private fifth floor balcony and enjoy views of Copper Mountain Village, and the surrounding mountains and Copper's slopes, or relax by the fireplace after a full day of mountain activity or soak in the three large hot tubs. Find the one that isn't too hot and isn't too cool, but just right. Just outside the condo is Starbucks for that early morning pick me up, also access to all the unique shops and restaurants, the outdoor climbing wall, the golf course, the West Lake, and the Center Village are just a minute away.This condo has access to both the American Eagle and American Flyer High-speed quad chairlifts for ease to some of the best skiing Colorado has to offer!This unit has got it all: full kitchen, VCR player and cable, gas fireplace, private balcony with gorgeous views over the resort, TVs in the bedrooms and living room, and private underground parking for one car per condo! ABOUT COPPER MOUNTAIN: Known as the 'Local's Favorite,' Copper Mountain is the largest ski and snowboard resort in Summit County. It is also the only ski resort that features naturally separated terrain, allowing beginners, intermediates, and experts to ski and ride on their own distinct areas of the mountain. Its central location (situated between Breckenridge/Keystone to the east and Vail to the west) makes it ideal for the guest who wants to get out and enjoy other resorts as well.With 2433 acres of ski able terrain, Copper Mountain is the biggest and least crowded mountain resort area in Summit County, Colorado. Despite being the biggest, it has the least amount of lodging units available which is the main reason for Copper's uncrowded lifts and runs. With its naturally divided ski terrain that separates skiers by ability across the mountain, Copper has been called 'the most nearly perfect ski mountain in the United States' by the Forest Service. It's also known as the Local's Favorite. Perhaps that's due to Copper's long, steep mogul runs, or its ample above-timberline open bowl skiing. You can get your skis out of your heated ski locker located on the first floor and be at the American Eagle Lift within a minute. 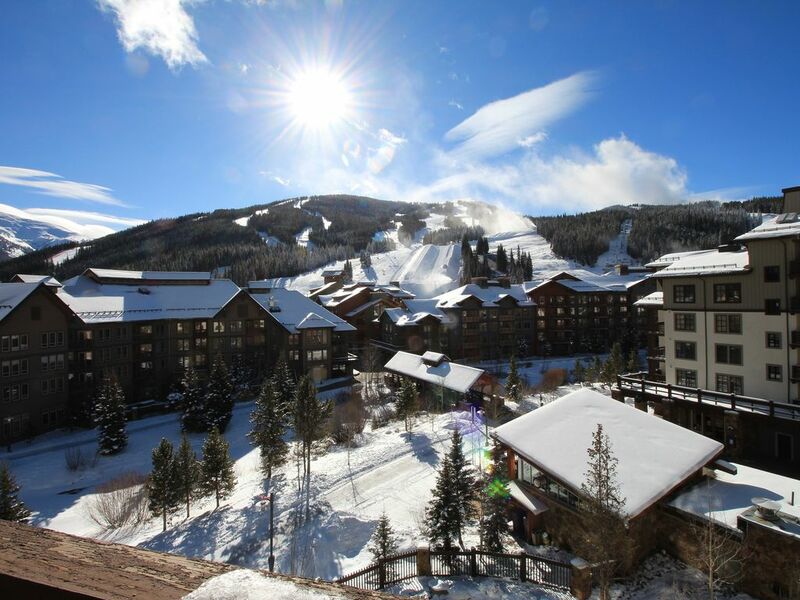 NOTE: We have a total of 8 condos at Copper mountain, so we have something for everyone. From slopefront to 200 yards away! Skis and Seas Vacation Rentals The Unique Benefits at this Condo: If comfort is what your looking for, look no further!! This condo has panoramic slopeside views from every bedroom as well as the private balcony! This non-smoking, condominium is located directly in the heart of Copper Mountain's Center Village. If comfort is what your looking for, look no further!! This condo has panoramic slopeside views from every bedroom as well as the private balcony! This non-smoking, condominium is located directly in the heart of Copper Mountain's Center Village. one car is allowed in the garage per condo. Condo was in the perfect location. It is much roomier in person than it looked in the photos. Elevator, ski lockers, heated parking, washer and dryer made this stay a dream. Best ski experience we’ve ever had. The coffee pot needs to be replaced and the plugs are all very loose making it difficult to keep chargers plugged in. Other than that we would stay here again no question. We have stayed in Copper Mtn now 3 times, and have loved it every time. This unit is clean, well stocked and plenty roomy. It's also close to all of the activities and very convenient. Would love to stay here again! The location was great. It got us within easy walking distance to the slopes. We enjoyed the convinence of this property and the comfort of the facility. It was comfortable and provided most of the amenities that you would expect at such a place. If we were to ever make another trip to Copper Mountain, we would likely inquire as to the availabilty of this property. We love Passage Point and have rented several times from this owner. We've never been disappointed! View was amazing, and the condo was comfortable, spacious, and relaxing! This condo is in a great location--close to the ski lift and all the village shops. We enjoyed the balcony and the view. Although we didn't do any cooking, the kitchen appeared to be very well stocked with dishware, utensils, etc. However, the unit is looking worn and could use some maintenance. The shower in the main bath--the kind that is part of the tub and you lift a lever to switch to shower mode--didn't work correctly. Only half the water would redirect to the shower. The carpeting was stained. The windows were stuck shut (we were there in August). One smoke detector was sitting on a table with the battery removed--did not inspire confidence! Some minor irritations: the kitchen sponges looked like they'd been there for years--really grubby; no dish towels provided; the blanket inside the comforter in the smallest bedroom appeared to be the wrong size so you ended up with no blanket in half of it; the hand towel in the main bath was dirty. Even with these issues, it turned out to be a good place for us five adults--enough room and privacy for all. We are very sorry that you had some issues during your stay and wish you would have said something to us so we would have had a chance to fix it. The shower has been fixed, the stain on the carpet has been cleaned, not every window opens but one does in each room, the smoke detector has a new battery and we have a new blanket. We are glad that you had a nice time even though there were a couple of minor problems and hope that you give us another chance when you are in Copper again.